NATO and its partners in the military campaign to protect Libyan civilians have decided to extend their mission another 90 days, the alliance’s top official said Wednesday. “This decision sends a clear message to the Gadhafi regime: We are determined to continue our operation to protect the people of Libya,” said NATO Secretary-General Anders Fogh Rasmussen. Libyan leader Moammar Gadhafi is trying to withstand the NATO air barrage and put down a rebellion among his own people. Wednesday’s decision came during a meeting of ambassadors from the 28 NATO countries plus ambassadors from the five non-NATO countries participating in the Libya campaign _ Jordan, Qatar, Sweden, the United Arab Emirates and Morocco _ said Carmen Romero, the NATO’s deputy spokeswoman. The military alliance took over command of the operation on March 31 after difficult negotiations among its members. Unanimity of 28 is required for action, and the operations to enforce a no-fly zone and use air power to protect civilians were authorized for an initial 90 days. That time would have expired June 27. The decision to extend the campaign was taken nearly a month ahead of time to allow the participating countries to do their internal planning, Romero said. NATO also is enforcing a U.N. arms embargo against Libya. That part of the operation has no time limit. Critics have charged that the military campaign has turned into a stalemate and said it is difficult to dislodge a government through air power alone. But NATO, while maintaining that regime change is not its goal, says it has significantly diminished Gadhafi’s ability to attack civilians. 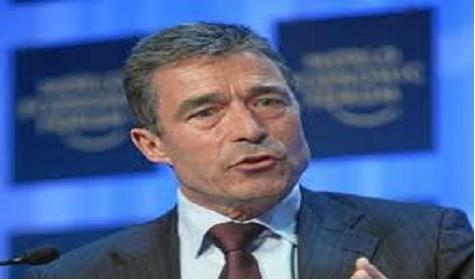 Fogh Rasmussen said in a statement that the extension of the campaign carries a message not only for Gadhafi but for the Libyan people.